“Covered in Band-aids” is the name of one of Zoe’s favorite songs by one of her favorite bands, Recess Monkey. I can hear it playing down the hall right now as she’s drifting off to sleep, after a serious day of playing, including dancing with enthusiastic abandon in the mosh pit at her first Recess Monkey show. Recess Monkey is a rock band for kids, made up of three teachers from Seattle. They are really fun and put on a great show. 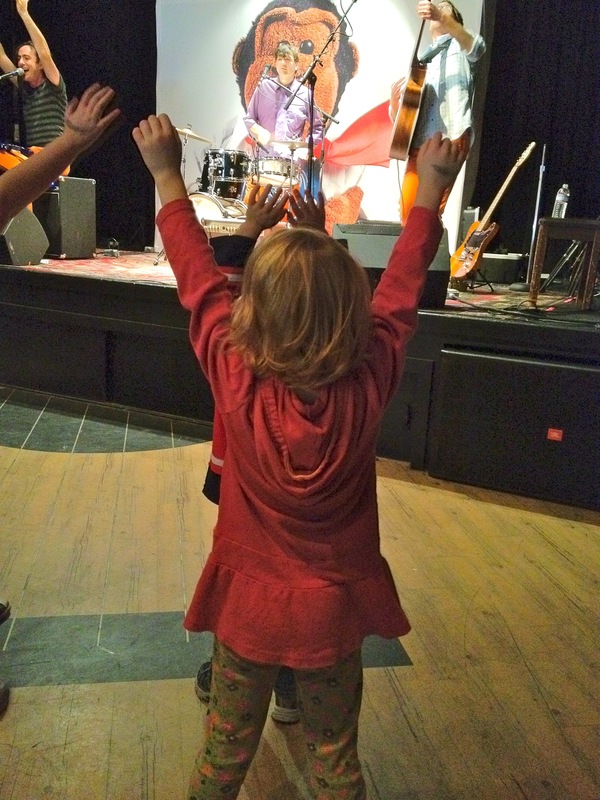 You can never start too early training to be a groupie. We stood around and high-fived the lead singer, who said Zoe was the queen of the dance floor. We bought our merchandise from the drummer, who also led the kids in the roller coaster dance. Zoe will be wearing her Recess Monkey t-shirt to school tomorrow. I’m not even kidding. I love live music and going to shows. I love dancing. I don’t care that I’m not very good at it. It makes me happy. Zoe really loves dancing. And she’s good at it. I’m not sure where she got her sense of rhythm or her sense of style (maybe from Aunt Susannah?) but I am delighted that she possesses them. We were in the front row, but rarely in our seats. Zoe would dance and come over to get me and ask me to make her jump, which I would do a few times per song until muscles in my back spasmed, and them we would just dance. Twirling and twisting and grooving and boogieing until she fell on the floor in paroxysms of laughter and delight. She was truly a happy kid. And I, after having been feeling not so great for the past few days, was lifted out of my funk in a wonderful way. Together, Zoe and I were, to quote a Recess Monkey song, flying. I am different when I have it on. Sounds like a fun afternoon with your best girl!